The Vitavia Venus Greenhouse is everything that a keen gardener could wish for in a greenhouse that “does what it says on the tin”, and more ! 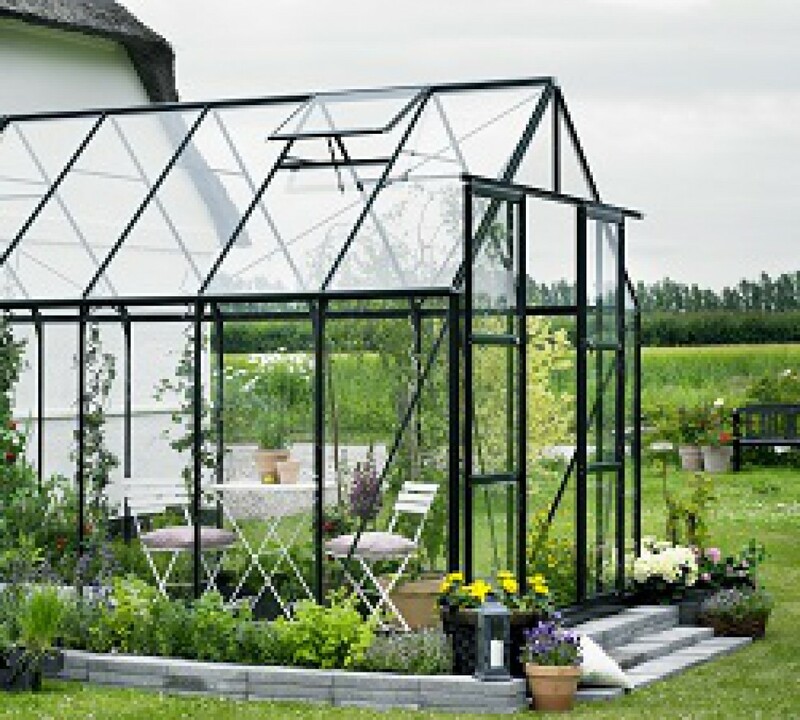 A greenhouse is a purchase that many gardeners can agonize over for weeks or even months, such is the choice available. However, most gardeners are looking for something solid that will last them years and years whilst being pleasing to the eye, after all you’ll have to look at it every day ! The Vitavia Venus really does fit the bill on all counts. It has a simple, solid design that will withstand the worst of our delightful British weather and looks smart and functional. The Venus is a 6ft wide greenhouse (6ft across the gable ends) that is available in silver or green. Vitavia greenhouse frames, well the silver ones anyway are anodized. Anodizing is a process that leaves the frames extremely shiny and this is how they remain as anodizing stops aluminium from dulling and going a nasty grey colour over time. Of course if silver isn’t for you go for a Venus in green. Vitavia Venus 6×4 Greenhouse in Anodized Silver. The Venus is available in a choice of either Horticultural Glass, Toughened Safety Glass or Twin Wall Polycarbonate. Horticultural glass is the cheapest and most popular option generally but it’s not ideal if you’ve a young family or live in a windy spot as it’s quite delicate and if it breaks it breaks into dangerous shards. Toughened glass is probably the ideal greenhouse glazing for UK gardeners as it is heavy, thick and highly resistant to heavy wind and the weight of snow sitting on it. Polycarbonate is the default choice for gardeners with small families and educational uses as it won’t smash and certainly isn’t heavy at all making it very safe indeed. Take a closer look. This video is a brief walk around a Venus 8×6 in Silver, on a rather dull English day ! 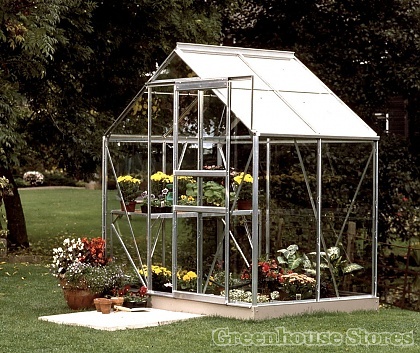 Vitavia Venus 5000 8ft x 6ft Greenhouse in anodized silver finish. 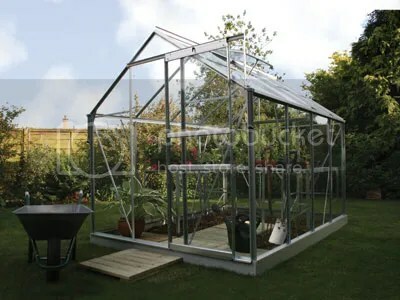 The Vitavia Venus Greenhouse makes a superb allotment greenhouse as it’s simple yet solid design will stand up to harsh weather without any maintenance due to the built in roof and corner bracing that keeps the greenhouse rigid in the harshest wind, rain and snow.